The MX-1000 4G/LTE for AT&T is a high performance integratedplatform with advanced software enabling high availability. Limited Time Offer Order a router and get 2 months of 1GB data FREE! ($50 Value) - add router to cart and data plan will be included. 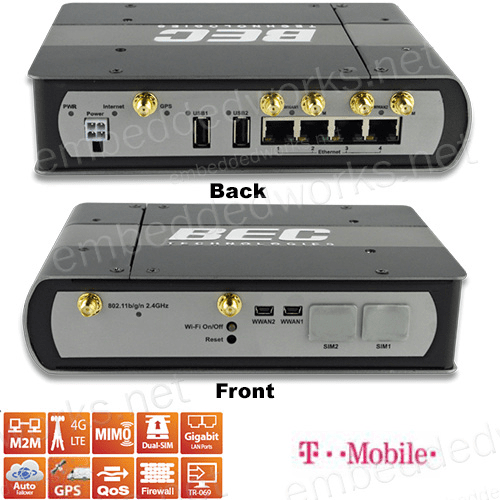 The compact rugged design integrates a 4-port Gigabit switch,carrier-grade Wi-Fi AP, multi-function USB hostinterface, embedded GPS w/ concurrent-multi-GNSS engine for GPSor GLONASS as well as a variety of configurable options -dual SIM/dual radio, enterprise routing, secured VPN, cloud-basedremote device mgmt. and power ignition control for in-vehicleapplications. Ideal for Enterprise, Business ,Logistics/Transportation and Fleet, Public Safety/FirstNetapplications. Multi-Service APN Selection and Mgmt. Designed to withstand heat, humidity and protect from shock,vibration, etc.